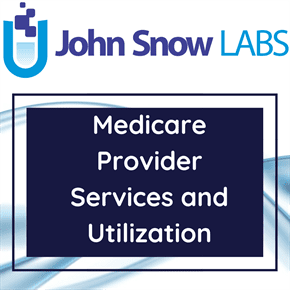 Moratoria Provider Services and Utilization dataset provides information on the number of Medicare providers servicing a geographic region and the number of Medicare beneficiaries who use a health service area. The dataset can also be used to reveal the degree to which use of a service is related to the number of providers servicing a geographic region as well as to determine which geographic and health service areas might be considered for a moratorium on new providers. The Moratoria Provider Services and Utilization data shows national, state and county level provider services and utilization data for selected health service areas. The analysis is based on paid Medicare claims data from the CMS Integrated Data Repository (IDR). The IDR contains Medicare & Medicaid claims, beneficiary data, provider data and plan data. Claims data are analyzed for a 12-month reference period. Results are updated quarterly to reflect a more recent 12-month reference period. The Moratoria Provider Services and Utilization methodology is different from other public use data with respect to determining the geographic location of a provider. In this analysis, claims are used to define the geographic area(s) served by a provider rather than the provider’s practice address. Further, a provider is defined as “serving a county” if, during the one-year reference period, the provider had paid claims for more than 10 beneficiaries located in a county. A provider is defined as “serving a state” if that provider serves any county in the state. The Moratoria Provider Services and Utilization methodology is also different from other public use data with respect to determining the number of Medicare beneficiaries who are enrolled in a fee-for-service (FFS) program. In this analysis, an FFS beneficiary is defined as being enrolled in Part A and/or Part B with a coverage type code equal to “9” (FFS coverage) for at least one month of the 12-month reference period. Beneficiaries must not have a death date for that month and must have a non-missing zip code so that they can be assigned to a county. Other public use data may define an FFS beneficiary using different criteria, such as requiring the beneficiary to be enrolled in the FFS program every month during the reference period. 1. The following United States territories, commonwealths, and freely associated states are excluded: American Samoa (AS); Micronesia (FM); Guam (GU); Northern Mariana Islands (MP); Puerto Rico (PR); and the U.S. Virgin Islands (VI). 2. If a beneficiary’s county of residence cannot be determined, that beneficiary is excluded. (This generally represents a very small percent of the population (<1%). 3. Providers are excluded if they had paid claims for 10 or fewer beneficiaries located in the county. 4. Counties are excluded if 10 or fewer beneficiaries who had paid claims resided in the county.